Would you like to see our most Recent Newsletter? You could win $10.00 worth of shipping supplies, just for being on our Mailing List! Each month, 3 of our mailing list members will be randomly chosen to receive a $10.00 gift certificate for use at our website store. Drawings will be held privately for each month. Winners will be contacted by email and if we receive a response, that winner will receive a $10.00 gift certificate to use at our website. Winners will be contacted by email, and, if after two days we receive no response, a second email will be sent. If still no response, the prize will be noted as "Unclaimed". We do our best to insure that there are 3 prizes awarded. We may, in many cases, and at our sole discretion, contact multiple emails in an attempt to issue unclaimed prizes to others. Winners may decline. If declined, their prize will be awarded to another randomly drawn name. All drawings will be held privately. Persons may win only once every three months. If a name is drawn which has won within the last 3 months, their name will be returned and another name randomly drawn. 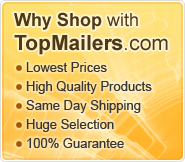 Gift Certificates can ONLY be used for products purchased from this website. No other items are applicable (this does exclude items won at auction). Indiana resident winners are obligated to pay applicable Indiana Sales Tax for the order. Certificates MUST be used in their entirety on one single purchase within 90 days of the issue date. No credits are given or carried over for unused portions of the Certificate. Certificates become null and void 90 days after the issue date. Certificates may not be divided between more than one purchase and/or person. eSupplyStore reserves the right to display, limit, alter, change or refuse to display any or all information provided by a Winner. eSupplyStore reserves the right to limit, alter, change the rules, or to end the Giveaway promotion at anytime, without notice or warning. If ended, all Certificates awarded and unused at the time of ending the promotion will still be valid until the end of their 90 day use period. Need to unsubscribe from our Mailing List? Simply enter your email address and then submit.